Success is a funny word, that makes different people feel many different emotions. You may read the word ‘SUCCESS’ and smile, looking back on all you’ve achieved, you may read the word and feel envious of those you believe to be ‘sucessful’, you may remember a time at school when you felt dissapointed at not passing this or that test, you may feel your stomach churn with nerves at the prospect of never being ‘successful’, or maybe you’re not too sure what that word means to you just yet. That’s the boat I am in right now. 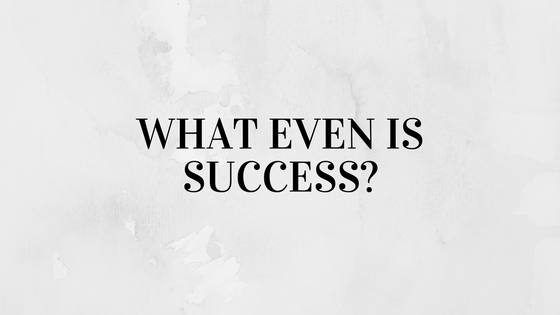 What is success? What does it look like? What does it look like to me? So let’s take a look at what the dictionary describes success as…. A couple of weeks ago, I visited London and took a quick trip to Harrods. As I was crossing the road to go inside, I saw a line of fancy black cars with people being helped out of them and for a second I stopped and had a moment of thought that didn’t leave me until much later on during the day. My thought was that that was never going to be me and I panicked thinking I was never going to be successful and since then I’ve thought about what success looks like. When I was 15, I would’ve probably said you’re only successful when you’re rich and famous (gossip girl probably played a massive influence on my thoughts) but when I was 18, success was just making it out of bed and through an hour at a time, or even every 5 minutes, it was eating that day, it was getting to college without having a breakdown. Now, I guess I have grander expectations for myself. I no longer class getting up as a personal success (although maybe I should) and I tend to go to bed at night thinking about what I could’ve done better at that day. Especially when other people around me are graduating or getting good jobs or incredible opportunities – I find it’s really easy to beat myself up about it. When really success looks different to everyone. To my friends being successful may be getting married, having a wonderful family and creating a stable life, or it could be finally moving to the other side of the world after months of dreaming, maybe it’s climbing to the top of the ladder in their chosen career path, it could even be finally being able to work for themselves. Maybe I would count myself successful if I ever got to write a book, or if I became a good enough writer to be able to freelance. Maybe it will be when I have a family one day. Maybe it will be when I can stand in a hat and gown, holding my degree. Maybe it will be the moment I get to dive into the Great Barrier Reef. Or maybe I’ll catch some other dreams along the way and decide to fulfil them instead. If there’s one thing I’ve realised while thinking about success, it’s that it’s never a good idea to measure your own idea of it against someone else’s. Your idea of what being successful looks like can be fluid and develop over your life, what matters to you now may not matter to you in 5/10/20 years’ time, or even from this year to the next. It’s easy to look at other people and think they are ‘more successful’ than you and it’s great to have someone or a group of people to look up to, to inspire you, but sometimes their success isn’t meant to be the same as your own. All you can do is try your best and work your hardest at what matters to you, whatever that may be. Next Let’s go to UNIVERSITY! so true! Often we work hard and do our best at things that don’t matter to us. Your comments ring true. Thank you for taking the time out to read and comment!